A few years ago you might quite rightly have wondered why you should bother posting a profile on LinkedIn because nothing ever happened. Launched in 2003, it took a while for LinkedIn to really get going. In the first quarter of 2011, it finally hit the significant milestone of over 100 million registered users. But four years later, that figure’s more than tripled. Given that one of these millions could be your next client, the question is no longer whether you should have a profile on LinkedIn, but whether you can afford not to. Now that LinkedIn is finally providing a decent professional environment where we can hang out together to discuss issues in private (closed) or public (open) fora, and also a means of finding translation jobs, many colleagues have jumped on the bandwagon. If you want to make the most of the interesting and potentially lucrative opportunities that can reach you through LinkedIn (I’ve been contacted by both direct clients and agencies via the site, and some of these contacts have led to jobs, so I can assure you that the effort is worthwhile), you now need to have a strong profile to stand out. The aim of these posts on LinkedIn is to give you a few pointers that will hopefully help you improve your profile and experience of the platform. However, although I’m going to use examples from my own profile (I don’t want to point my finger at any specific individual), please note that I preach more than I practise and I’m still in the process of acting on some of the advice myself. So let’s get down to the nitty-gritty. For starters your photo. You really should have one, because statistics say that your profile is far more likely to be viewed if you do, and that’s the object of the exercise. Ideally it should be a professional shot of yourself, or at the very least one with as plain a background as possible (there shouldn’t be anything to take attention away from you). Whatever you do, though, please don’t choose a photo of you with your beloved pet, child or spouse on your wedding day (no matter how gorgeous you looked in that dress!). You’re trying to present a professional image here, not find a new best friend or a date (although I have heard stories of colleagues being contacted for the latter reason!). Next, your headline. This follows you wherever you go on LinkedIn (for example if you post a link on the homepage, or if you start a discussion in a group, in search result lists, and it’s also displayed when placing the cursor over your photo/name when you make comments, etc.) so it needs to be good and informative. And the main information a potential client needs to know is whether you are the right person to help them or not. That’s why you should include your language pair (or pairs) and your specialisms, if possible and they fit in the space, or indeed any other details you think will grab a potential client’s attention and get them to click on your profile and read more. The words you put in your headline will also be picked up by the internal search engine, so if you don’t specify that you are a translator, interpreter, reviser, editor, copywriter, or whatever, you might not appear in the list of search results (unless you’ve included the title in the “experience” section). I’ve just run a search on LinkedIn for “XYZ English translator” (I won’t tell you which language XYZ is so that no one will feel in any way picked on and identified), and a colleague I am connected with who offers that pair didn’t appear in the results list. However personally satisfying it might be to state in your headline that you are the CEO/Director/General Manager of Bla Bla Translation Company, if being a general manager is not the service you want to sell, then perhaps you should reconsider its contents. You can always mention this detail further down the page in the “Summary” or “Experience” sections. As far as I can gather from my travels around LinkedIn, most people using these or similar titles are not running an agency and are actually sole traders/freelancers. And, by the way, simply saying “experienced” or “professional” (presumably we all are on LinkedIn) “freelance translator” will not help you get found in the search results either, or differentiate you from the crowd. 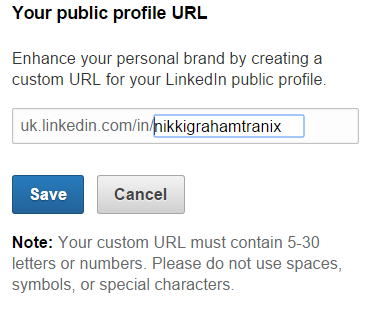 Moving on, your contact information includes an URL to your LinkedIn profile. This invariably includes some random numbers and letters at the end, making it visually less appealing and more difficult to remember. You can change this by clicking on the gear symbol (see above) next to it in your profile in edit mode, and then on the pencil (shown in the image above right). 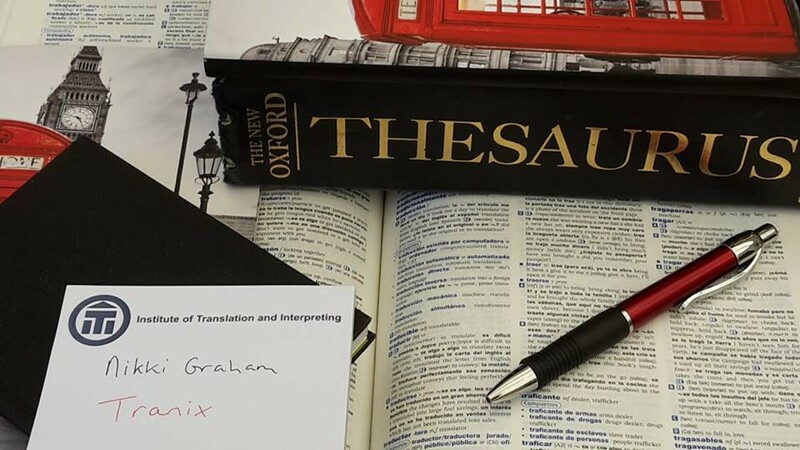 I’ve put “tranix” after my name as just “nikkigraham” was no longer available, although on second thoughts, adding all/part of the business name you trade under might be a good idea, since it will help people associate the business with you. In part two of this miniseries I talk about connecting and netiquette and in part three I take a look a the main “meaty” sections of your profile and give you some hints on what you can include. 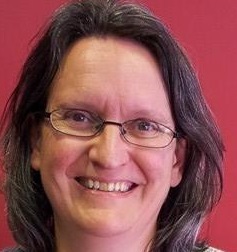 Thanks Nikki for the nice post about LinkedIn! I’m already doing all these things: nice profile, good headline, custom URL and I have my profile in two languages. I’ve spent a lot of time and effort making my LinkedIn profile impressive. So far the results have been rather dismal. So far only one person who connected with me on LinkedIn became a client and that was only for a couple small projects. Then the company went bankrupt. 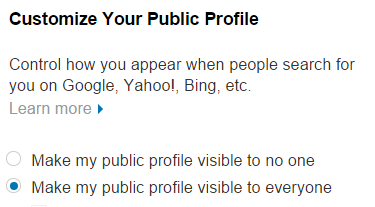 Other people have found me on other platforms (Proz, Facebook, etc.) and then decided to connect on Linked In. So as far as finding clients goes, LinkedIn is a MAJOR disappointment. So given that I’m following all the right steps and created a nice profile, what can I do next? Do you go ahead and ask to connect with people who may become potential clients? So far I’ve just had mainly other translators wanting to connect with me and then send me messages offering their services to me. I don’t have any projects for them. I myself am looking for projects and I’m not an outsourcer. I’ve come close to wanting to delete my LinkedIn profile in frustration but so far I haven’t gone that far. Would appreciate your advice for using this resource. I’ve replied to Sarah privately and will be including some of the ideas I gave her for her profile in later posts. Thanks for this Nikki, it’s really useful. Unfortunately I am what I refer to as a “techiot” (= tech idiot) and I cannot get the badge to appear on my page. It just displays as code. It will be useful once I learn how though so thanks for the tip! Thank you Nikki, that’s really helpful and motivating! I think of it as a public CV: lots of people who hear of you from other sources pop in and have a little browse.